Mamma Mia 2, the sequel to the highly successful ABBA tribute musical, opens in cinemas across the world this weekend and a surprise star has joined the cast: Mercedes X-Class pick-up. The hits of the famous Swedish band ABBA echo again in the cinema halls. Launched in 2008, “Mamma Mia!” was up until last year the highest-grossing musical in history, with over $ 650 million in gross revenue. Ten years after the first film, Meryl Streep and the gang return to “Mamma Mia! Here We Go Again, “and the producers are looking to conquer the box office using the same recipe: a” stellar “cast and ABBA music. Meryll Streep and Amanda Seyfried resume their first film roles: Donna and Sophie, mother and daughter. And Stellan Skarsgard, Colin Firth and Pierce Brosnan also return to the roles of the three possible fathers. The decor is the same: a Greek island paradise, where Sophie manages the family business. “Mamma Mia! Here We Go Again “is both a sequel and a prequel. The story of the present, 10 years after the events of the first film, opens in countless flashbacks to the ’70s, in the glory of disco music. Each important character has a correspondent in the past, and the younger version of the character played by Meryl Streep is played by Lilly James. Lilly James is a welcome addition to a cast which also grows to include a surprise member, the 2019 Mercedes X-Class, the first series production pick-up truck of the German brand. A silver example is driven by Stellan Skarsgard, an adventurer who once sailed the seas and stole the heart of Meryl Streep’s character, Donna. 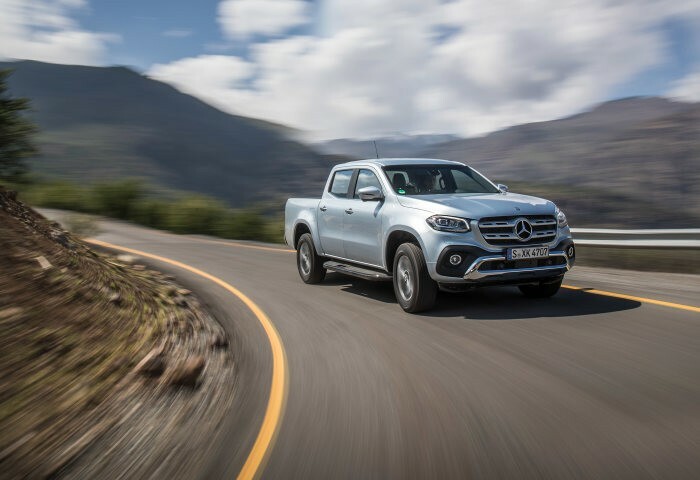 The role of the X-Class is a well chosen one, as this is exactly the sort of active life style owner Mercedes would want for its pick-up.